HomeFAQWaste Tyre Recycling Pyrolysis PlantWhat is pyrolysis in detail? Pyrolysis is a thermochemical decomposition of organic material at elevated temperatures in the absence of oxygen (or anyhalogen).including wood pyrolysis，waste paper pyrolysis，when the temperature elevated the material will vaporize. The pyrolysis is a chemical reaction. This reaction is a process that molecular breakdown larger molecules into smaller molecules in presence of heat. And the process is used much in the chemical industry, it is used to transform the medium-weight hydrocarbons from oil into lighter ones such like gasoline.The pyrolysis is called distillation, destructive, and so on.The typical use of the pyrolysis is the food cooking, when we cook our food we will heat the raw material of the food.The molecule of the food will breakdown into smaller molecular. The smaller molecule is of more beneficial to our health. 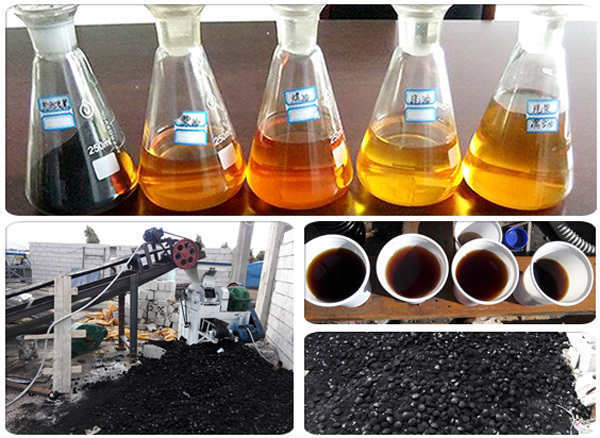 There are typical methods of waste plastic cracking extraction liquid oil. The different methods are for different kinds of plastics, the cracking products are mainly liquid oil, Secondly products are fuel gas and residue. As we know object composed of molecule.If the molecule recombination we will get new things.The pyrolysis is the application of the law.When the temperature elevated at a high temperature that the molecule will breakdown into smaller molecules. Then we will get useful and economical products.For the simple example: If we pyrolysis the waste tyre&waste tyre we will get oil products or gas.In the suitable temperature, pressure and the suitable catalyst we will greatly increase the special long chain products to get some economics products such as diesel and gasoil. Plastic pyrolysis technology is a process that uses high-temperature pyrolysis chemical reaction in a closed oxygen-free reaction kettle to heat the reaction kettle to pyrolyze waste plastic into fuel oil, carbon black and combustible gas, affecting the final product and oil production rate. The main factors are the heating method, temperature and catalyst. The temperature of cracking should be PS<PP<PVC. 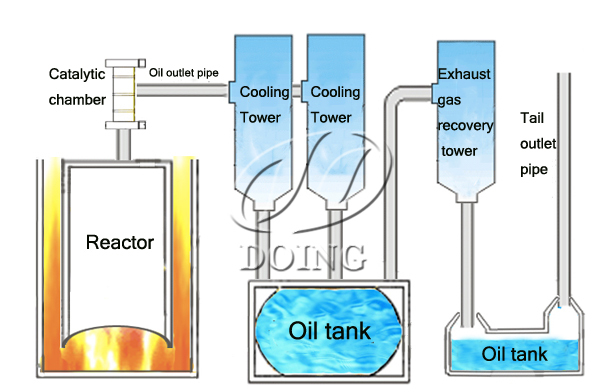 We improve the efficient of heat transport,Thus will reduce the burned black,This will make the life of the reactor longer and improve the efficient.And we have special method to deal with the carbon black deposited the reactor which greatly deduce coking and improve the efficient.we have the negative pressure to improve the oil yield rate.This technology requires a high standard for the reactor and equipment.This is the very accurate technology of the chemical reactor. What is more we have the special designed catalyst to improve the quality of the fuel oil. 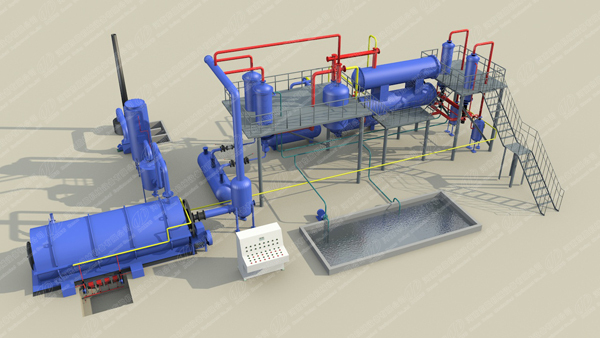 What are the final products of plastic pyrolysis plant? Through Henan DOING Mechanical Equipment Co., Ltd.'s plastic pyrolysis plant you can get fuel oil,carbon black,and gas.They have waide usage in our dailylife,fuel oil can be used in steel mills, boiler heating, heavy oil power plants and cement plants to produce refined diesel for further processing and diesel generators, light fuels, heavy machinery.And the second main products-carbon black also have very high industrial value.It can be sold directly,or ne further processed before selling.At present,there are mainly 2 further processing ways for carbon black.One is briquetting,the other one is grinding. Where are our equipment installed? So far, Henan DOING Mechanical Equipment Co., Ltd's pyrolysis plant has been successfully installed and operated in more than 50 countries and regions, such as Italy, Macedonia, Iran, Egypt, Mexico, Ecuador, Haiti, Congo, Uganda, Nigeria, India, Pakistan, Thailand, Malaysia. , Bangladesh, Guatemala, etc. In short， the recycling of the waste plastic can create economics profits and solve the environmental problems by our plastic pyrolysis plant. prev: Is waste tyre pyrolysis plant have pollution to environment? Next: What we are achieving from waste tyre pyrolysis to oil process?